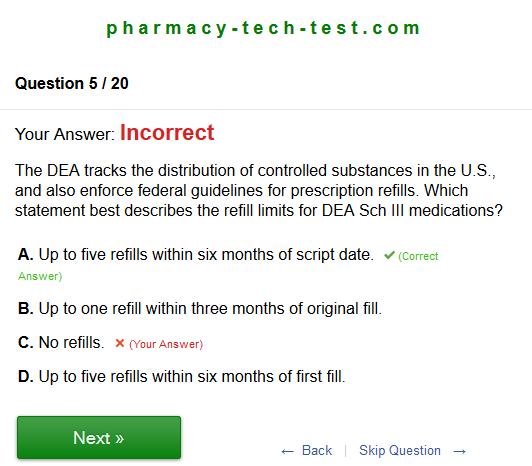 This free DEA Controlled Drug quiz is presented in the same format as the PTCB™ and ExCPT tests. This is just a short (20 questions) quiz to help you warm up to the format you will be tested with during the National Certification Exam. The questions on this exam are full length, and in a multiple choice format. Thanks for using this FREE PTCB practice quiz. Each question was originally written, and designed to prepare students for the PTCB™ or ExCPT exams. Although these quizzes are great learning and study tools, please keep in mind they are not official and not endorsed or approved by any authority. By visiting this site, you automatically acknowledge the content on each page is for educational and entertainment purposes only.